The Doylestown Gold Exchange is one-of-a-kind retail store in Bucks County area - Times Publishing Newspapers, Inc. 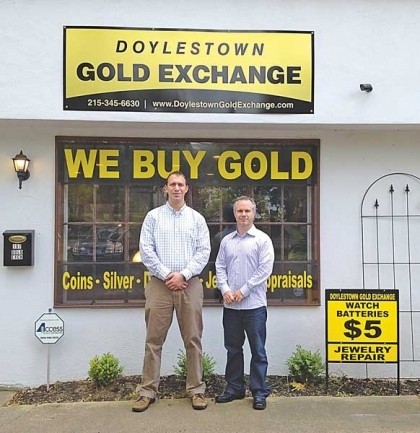 The Doylestown Gold Exchange is a family-owned and operated business that strives to be active in the community and show why they’ve been voted the Best Gold and Precious Metals buyers for four years straight and “One of The Best Jewelers in Bucks and Montgomery Counties” for six years straight. Greg and his partner, Kyle Goodman, are entering their seventh year in business. Their reputation and service is well-known, earning the trust of their customers and community. The Exchange is a full-service jewelry store that offers new and estate jewelry, professional jewelry and watch repair, along with being a full-service gold buyer and dealer. They buy gold, silver, platinum, and diamonds, and help families settle and liquidate estates. As people look to invest in gold and silver, they are always open to talk and help you learn and understand the physical metals. “Feel free to stop in anytime to see how we are different than any other jeweler or gold buyer in the Bucks county area. We would like to wish everyone a happy and safe holiday season from all of us at DGE.” – Greg, Kyle, Sabrina and Kristy. PHOTO CAP: Kyle Goodman and Greg Glemser, co-owners of the Doylestown Gold Exchange.